"Gripping and meticulous, Nick Turse's reporting on Africa sheds much-needed light on shadowy missions the U.S. military would rather keep secret. His investigations of U.S. military missions in Africa in Tomorrow's Battlefield reveal a secret war with grave implications for Africans and Americans, alike. 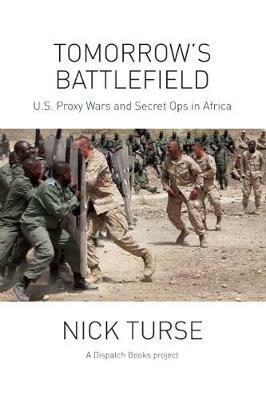 "Nick Turse's investigative reporting has revealed a remarkable picture of evolving US military operations in Africa that have been concealed from view, but have ominous portent, as he demonstrates vividly and in depth." "In the first book length account of AFRICOM's operations, Nick Turse chronicles how in a very short time, Africa went from the margins of US foreign policy--to be not just the warzone of tomorrow, but of today." "U.S. military training missions, joint exercises, military aid operations in many different countries, most ruled by repressive regimes... sound like the Middle East? The Arabian Peninsula? Think again. The indispensable Nick Turse introduces us to the rapidly expanding American military footprint in Africa. It is astounding how few other journalists have paid attention to this highly important story." "A dogged and intrepid journalist who won't take 'no comment' for an answer, Nick Turse has done a fantastic job of exposing the U.S. military's expansion into Africa and the proliferation of its secret missions on the continent." "Tomorrow's Battlefield is an urgently needed resource for all those seeking ways to end military intervention in Africa."